The Zags and Broncos have played twice since then. Combined score: Gonzaga 189, Santa Clara 87. It comes as no surprise, then, that BYU (5-2, 13-9) players and coaches had nothing but praise for No. 4 Gonzaga (6-0, 19-2) on Wednesday afternoon as they prepared for the Zags’ annual visit to the Marriott Center, Thursday at 9 p.m. MST on ESPN2. Some are suggesting that this 2018-19 version is Few’s best team yet, and maybe the best opponent to visit the Cougars’ 19,000-seat lair in Rose’s 14-year tenure. That’s saying something, considering the Zags played for the national championship two years ago, finished 37-2 and featured stars such as Nigel Williams-Goss, Jordan Mathews, Johnathan Williams, Przemek Karnowski, Zach Collins and four guys who are still around — Rui Hachimura, Killian Tillie, Zach Norvell Jr. and Josh Perkins. “We have played some good teams in here,” Rose said, referring to No. 3 San Diego State in 2011, No. 6 Wake Forest in 2009 and No. 10 Baylor in 2011. “But there is no question that this Zags teams could play with any of those teams on a consistent basis. And I think they are more experienced than their No. 1 team that came in here two years ago” and beat BYU 85-75 before the Cougars stunned them in Spokane more than three weeks later. Santa Clara isn’t the only WCC team that has been obliterated by Gonzaga this month; The Zags’ margin of victory in conference games is 31.2 points. Gonzaga is a 14-point favorite Thursday night. The Cougars can only hope current stars Hachimura, Tillie, Norvell and Perkins have forgotten that stunner at The Kennel in 2017. They are bolstered by San Jose State transfer Brandon Clarke, the nation’s leader in field goal percentage, Corey Kispert, Geno Crandall and a handful of other reserves who would easily start for any other team in the league. 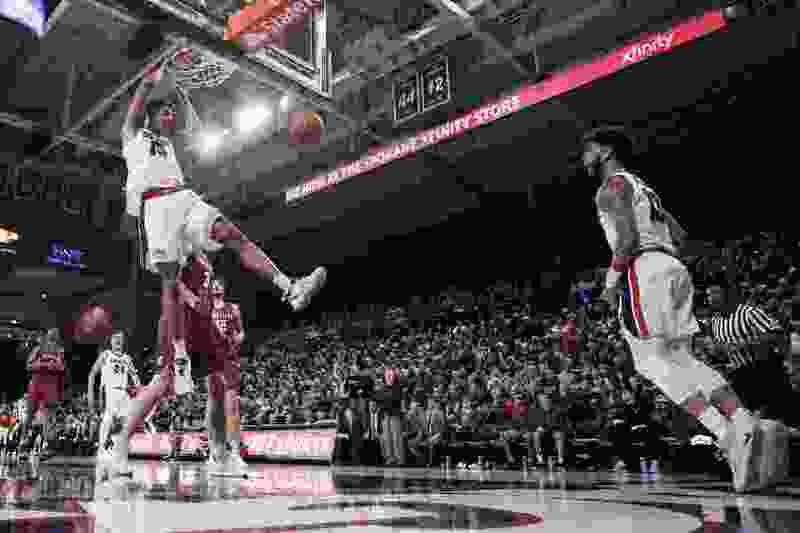 Jim Meehan, longtime Gonzaga beat writer for the Spokesman Review, said an explosive offense sets this GU team apart from others he has covered, even though Tillie and Crandall have yet to hit their stride after missing significant time due to injuries. Kendra Andrews, a former Salt Lake Tribune sports intern who covers the team for the student newspaper, The Gonzaga Bulletin, and contributes to TheAthletic.com, goes “back and forth” between which GU team is better, this one or the team that fell 71-65 to North Carolina in the national title game. If the Zags have a weakness, it might be defense, Meehan noted, although that hasn’t been apparent in WCC play as GU has held two league foes to fewer than 40 points and three to fewer than 50. Clarke, a 6-8 junior from Phoenix, is third in the country in blocked shots, with 66. “GU’s defense has been much better in conference, but it is hard to gauge that because the caliber of offenses isn’t the same as the top teams on their non-conference schedule,” Meehan said. Can the Cougars stay within 20? Tipoff • Thursday, 9 p.m.
About the Bulldogs • Like the Cougars, they last played on Jan. 24. They defeated Santa Clara 98-39 for their 27th straight conference road win, an NCAA record. … San Jose State transfer Brandon Clarke leads the country in field goal percentage (69.0) and is fourth in blocked shots per game (3.14). … They lead the country in field goal percentage (52.4) and scoring offense (91.4 ppg.). … They have won three straight games against BYU, including a 79-65 win last year at the Marriott Center. About the Cougars • BYU and Saint Mary’s have defeated the Zags five times apiece since BYU joined the WCC in 2011-12, more than any other WCC teams combined. ... Junior F Yoeli Childs has 32 career double-doubles, fifth-most in school history. He leads the league in scoring with a 22.3 average, which ranks him No. 16 in the nation. … Freshman F Gavin Baxter is averaging 8.3 points, 5.0 rebounds and 2.3 blocks while shooting 78.6 percent over the last three games.